« What is a Hate Crime? The controversy over the North Dakota pipeline will continue to grow in the coming days. 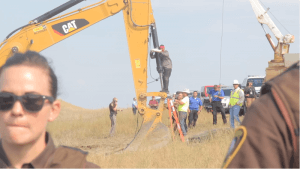 Lately mainstream media has been catching flak for not covering the controversial North Dakota pipeline construction being protested by members of the Rock Sioux tribe. That being said, after gruesome photos of guard dogs with bloodied mouths surfaced and after the pipeline company allegedly bulldozed through native burial sites, larger news outlets are beginning to pick up the story. Originally, the fact that the pipeline is intended run under the tribe’s only water source was the root of the discord, but most recently the pipeline company allegedly destroyed sacred burial sites despite the fact that attorneys filed evidence in federal court that indicated how the path would in fact traverse over those sacred sites. What is Considered Sacred Under Federal Law? Why is it that a private company can destroy sacred sites of an entire cultural group? Under federal law, we have often discussed the protections of religious freedom under the United States Constitution. You can read more about those issues here. In addition to the U.S. Constitution, Congress has enacted legislation that, at least in theory, protects sites deemed sacred by Native Americans. Of these acts, the National Environmental Policy Act (NEPA), the National Historic Preservation Act (NHPA) and the American Indian Religious Freedom and Restoration Act (AIRFA) are extremely valuable in aiding in the protection of indigenous sacred sites. Under NHPA, which took effect in 1966, the legislation is designed to preserve historical and archeological sites of significance. Historic properties are defined as a site or historic district, building, structure, object, artifacts or remains eligible for the National Register of Historic Places. It is important to note that the site does not have to be listed on the National Register; it need only meet the qualifications. If proposed government action may affect a historically significant place, a citizen may request a Section 106 review that will require governmental agencies to develop a plan intended to protect the site as much as possible. Even still, the Section 106 findings do not wholly prevent the potentially harmful action. In addition to NHPA, NEPA is also used as a tool to protect sites of cultural significance. Under NEPA, the government must perform a complicated assessment of how activities may affect the “human environment” in a particular area. Matters of social or cultural significance are deemed a part of the human environment and thus must be considered in determining whether the project can be carried out. Finally, Congress also enacted AIRFA in 1978 as a means to provide American Indian access to traditional practices they would otherwise be prohibited from participating in. For example, tribes should be allowed access to holy sites even if they are protected as culturally significant by the federal government. Although there are many legal avenues available in declaring a particular site to be of religious or cultural significance for purposes of federal protection, the review processes can be tedious and costly. It stands to reason that many sites still do not enjoy such protections because no one has initiated the complicated processes. At Universal Life Church, we strive to stay aware of current events involving religious beliefs and practices and through our blog, we intend to informed of how certain laws apply to these situations. We understand that many issues are complex and to complicate matters, the laws that dictate how matters should be treated often change to reflect the current political climate. Please continue to check with us frequently for updates and new information on religion, the law, and how the two meet.